Nicholas Romanov – the early years of his rule. 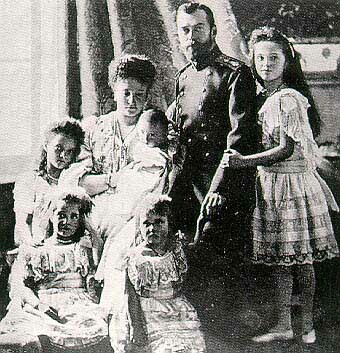 Nicholas Alexandrovtich Romanov became the Tsar of all the Russias in 1894. Incidentally his name has the stress on second syllable and not the first as Anglophones often incorrectly assume it to be. Thus, one accentuates the name as ‘ro MAN ov’ and not ‘RO ma nov’.The Romanov dynasty had reigned in Russia since 1613 when the 16 year Michael Romanov from a not especially distinguished noble family had been agreed upon as a compromise candidate to be the new Tsar or Russia after the Time of Troubles. Alexandrovitch was the patronymic of Nicholas II. This is because his father was named Alexander. Russians do not have middle names as Westerners understand then. The patronymic is taken from the person’s father. With a girl as with a boy the patronymic comes from the father and never from the mother. One simply takes the father’s personal name and appends ‘ovitch’ for a boy meaning ‘son of’ or ‘evna’ meaning daughter of for a girl. Nicholas II was known as Tsar of all the Russias. The Russian Empire extended from what we now know as Poland all the way to the Pacific coast. It stretched from the permafrosted wastes Arctic Circle to the scorching sands of Central Asia. This sheer massiveness may seem to be a strength as the territory was so gargantuan that it could not be conquered. However, it was equally difficult to rule. Even with modern transport technology to control such a vast area is exceedingly difficult. Nicholas II acceded to the Imperial Throne when cars were but 10 years old and very slow and prone to breakdown. The most rapid means of overland transport was by train and the railways connected only major cities in the westernmost regions of the Russian Empire. 25% of the land mass was in Europe and 75% in Asia. The population was the other way around with 75% of the people dwelling in the European section of the Empire and a mere 25% of the people residing in the Asiatic part of the Russian Empire. It is of course open to questions whether Russia is part of Europe at all. People nowadays often speak as though it is not. Classically Europe’s eastern boundary was taken to be the Ural Mountains in Russia. Nicholas II enjoyed many titles. He was ”Autocrat”. This comes from the two Ancient Greek words, ”auto” which translates as ”self” and ”cratos” meaning ”power/rule”. Therefore Nicholas was one who had the legitimate right to rule on his own. He did not have to share power with any elected or even hereditary assembly. He had the absolute power to do whatsoever he pleased. He was called the Tsar of all the Russias because there were three places Russia could refer to. There was true Russia which is the area within about a 500 mile radius of Moscow. Then there is Belarus which translates ‘White Russia’ which lies to the west of this true Russia and to the east of Poland. Then there is the Ukraine. The Ukraine is known as Black Russia owing to its black and very fertile soil, it abuts onto the Black Sea. (Notably the Black Sea has that name ‘Black Sea’ in all the languages of the countries that have a coastline on it – in Russian, Ukrainian, Romanian, Bulgarian, Turkish and Georgian it is called the Black Sea as well as in other major world languages such as French and German.) The Ukraine is also known as Little Russia despite being rather larger than Belarus in land. Belarus and the Ukraine were ill-defined at the time. The Russian Empire was divided into scores of provinces. There was no one province called the Ukraine or Belarus. It was dubious as to which provinces and which fractions of provinces constituted the Ukraine or Belarus. As in most empires breakup was feared and discouraged.The state did label an area the Ukraine lest this facilitate secession. Non-Russian identities were discouraged. Indeed, Alexander III’s motto had been ”Autocracy, Orthodoxy, Nationality.” By this he meant absolute rule by the Tsar, the promotion of the Orthodox Church and the emphasisation of Russian national identity. People who were similar to the Russians such as Ukrainians and Belarussians were urged to think of themselves as Russian and call themselves Rusian. This largely worked with these two groups. Some felt that, say, a Ukrainian identity could fit inside being Russian. Other Ukrainians did not feel Ukrainian at all and simply called themselves Russian and only spoke the Russian language. Back in 1800 industry in Russia had been on about the same level as that of many other European countries. That meant that Russia was far behind the UK which was the only industrialised country at the time. However, many other European countries made steady progress in industrialisation through the 19th century whereas up until about 1894 Russia made almost no headway. After about 1894 Russia started to make very rapid headway indeed. France was Russia’s key trading partner and the French Government extended huge loans to Russia. France invested heavily in Russia with French firms owning many concerns in Russia. Germany was also a major trading partner with Russia and a big investor in Russia. The UK and the United States were also large investors in Russia. Marxists began to see Russia as a colony of the Western advanced economies. Russian agriculture was finally improving in the late 19th century. The grain surplus was shipped out from the Black Sea port and through to the Aegean Sea and the Mediterranean. From there the grain was sold on. This was Russia’s main foreign currency earner and therefore crucial to funding industrialisation. Germany was seen as the main potential enemy in 1894. However, many in Germany wished to remain friendly with Russia. Bismarck, the former Chancellor of Germany, counselled this course of action. War against Germany was far from a foregone conclusion. The alliance with France could well have been substituted for an alliance with Germany. Russia felt the age-old enmity towards the Ottomans. Russia eyed India eagerly. It had long been British policy to prop up the Ottoman Empire to stop Russia from breaking through into the Mediterranean and interfering with British interests in the Middle East. It sat oddly that Russia was allied with France. When French dignitaries visited they were greeted with the French national anthem, La Marsaillaise. This was of course a song celebrating the French Revolution and was used as a rallying cry by revolutionaries the world over at the time. It was forbidden in Russia except of course when greeting French VIPs. Radicals in France sympathised with Russian revolutionaries and were deeply uncomfortable with the alliance with Russia as this could be said to bolster Tsarism. Tsarism preached religious intolerance, absolute monarchy and obscurantism. It was exactly the sort of wretched setup that France had ousted in 1789. When Nicholas II acceded to the Imperial Crown some reform-minded gentry asked him whether he might establish some form of parliament and involve them in the running of the state. Nicolas II replied that some entertained ”senseless dreams” of obtaining a voice in government however, ”we shall preserve the principles of autocracy that we have inherited from our most illustrious ancestors utterly intact.” Nicholas II firmly believed that he had been placed on earth by the Almighty to reign over the benighted masses and they had no right to question the imperial will. Who could judge the Lord’s anointed but the Most High himself? The Tsar was the instrument of inscrutable divine will. It was a doctrine of the divine rights of emperors derived from Byzantine thought. The powers that be are ordained of God. It is not for mere subjects to questions this divine favour. Byzantinism said much about the nature of the Russian State. 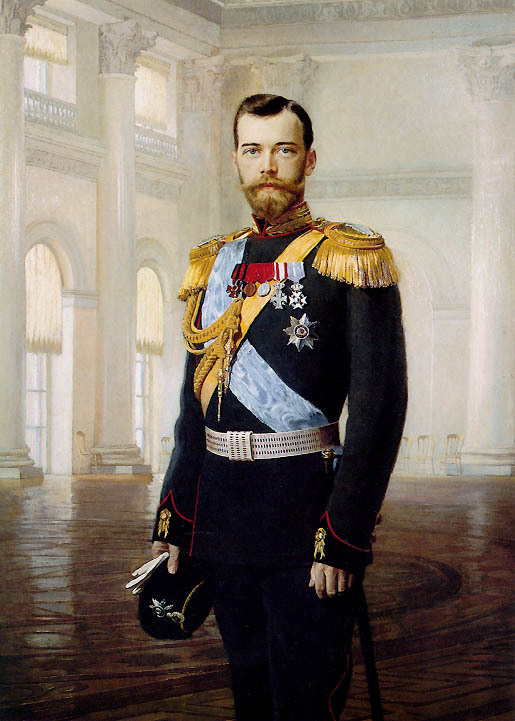 Nicholas II could not permit any diminution of imperial power. To allow political parties and elections would only leave common people addled and it would cause ructions. Censorship was strict. Anything that tended to undermine Tsarism was forbidden. However, some Marxist works were allowed to be published. Furthermore, Lenin was allowed to publish some of his books on the grounds that they were so turgid and bland that next to nobody would ever wish to read them. Many Russians supported Tsarist absolutism. They remembered the Times of Troubles in the first years of the 17th century. The lessons that many Russian drew from this was that one either had tyranny or one had anarchy – and tyranny was better. For the first few years of Nicholas II reign things bubbled along without any great disturbance. Russia was industrialising with increasing speed. Improved agricultural techniques had freed labour from the fields. More peasants drifted to coalfields to work as miners or into cities to works in factories and in mills. Others found other employment among the urban proletariat as waiters, bus conductors or servants. The major project of the 1890s was the Trans Siberian Railway. This mighty feat of engineering would open up the gorgeous east and allow Russia to tap the limitless potential of resources in that isolated region, to trade with the Orient and to exert military force in the Pacific Ocean and beyond. Kaiser Wilhelm II of Germany sent a telegram to Nicholas II saying, ”the admiral of the Atlantic greets the admiral of the Pacific.” This message indicated not only that Wilhelm II had pretensions to wrest dominance over the Atlantic from the United Kingdom but also that he was encouraging Russia to seek hegemony in the Pacific. Germany had but a few scattered not especially valuable possessions in the Pacific. Germany saw that the UK may become her enemy. Germany did not wish Russia to be an ally of France and/or the UK. If Germany could persuade Russia to challenge the UK for paramountcy in the Pacific that would set Russia on a collision course with the UK. Russia may then seek German aid and break off the alliance with France. Who were the UK’s traditional enemies? Russia and France. Who were Germany’s potential foes? Russia and France? Would it not make more sense for these two Germanic peoples to team up? Their ruling families were closely related – more so than the imperial houses of Russia and Germany. The UK had the biggest and best navy and Germany had the biggest and best army. Put together would they not make a simply unbeatable combination? Their strategic interests need not clash? If the UK remained an oceanic power and Germany then they could work together. Russia envied British dominance of the Middle East. It was often said that Russia wished her soldiers to wash their boots in the Indian Ocean. This would give Russia that elusive warm water port. British parliamentarianism and Russian autocracy seemed to be poles apart. Of course there had been times when the UK and Russia had worked together such as during much of the Napoleonic Wars. Could the United Kingdom and the Russian Empire work together once again? Protected: Dream of meeting a clairvoyant. Filed under Personal views |	Enter your password to view comments. Alexander Lukashenko has ruled Belarus almost since it became independent. He was the manager of a state farm in the Soviet era. He runs Belarus in much the same manner. It is centralised and state control is stifling. The country is creaking. The economy is stagnant and innovation is viewed with suspicion. It is generally accepted that Lukashenko is a semi-dictator. Let us give him his due, opposition parties are allowed and they contest elections. This is more than can be said for the Soviet period. However, opposition politicians are subjected to severe harassment by the police. The police is a weapon in the hands of the governing party with which to beat oppositionists. The opposition have not been able to rally around a candidate and seven of them stood against Lukashenko. There is no doubt that Lukashenko does have substantial support. Probably a plurality of the people back him. Some are blinded by state propaganda and see Communism as good and his opponents as being in the pay of the CIA. The army parades with the Soviet flag as well as that of Belarus. This is ominous. Lukashenko was rash enough to agree to an interview with euronews. He seem not to have been briefed on the questions. He gave a good account of himself. If I were him I would only speak to pet journalists throwing me softball questions. Journalists who expose facts that are disobliging to the government in Belarus have an unfortunate habit of meeting with nasty accidents, often fatal. I hope that Belarus becomes free one day. Protected: Dream – Ozzie taxi ride. Marxism means the theories and teachings of Karl Marx. Marx was a German political philosopher and revolutionary who stalked the earth from 1818 to 1883. His writings had an extraordinarily strong and regrettable effect from about the time of his death until 1991. Fortunately, nowadays his ideas are widely disparaged. Marx was of Jewish origin. His grandfather was a rabbi and his uncle was the chief rabbi of Trier, Trier being the city where Marx was born and lived until the age of 17. Marx’s parents had converted to Christianity of the Protestant type. It is probable that they were baptised to avail themselves of full civil rights. Jews were lawfully discriminated against in almost every German state at the time. Marx’s father was a lawyer and would have been disbarred from his profession. The fact that Karl Marx had Hebraic ancestry was made much of by anti-Semites. They claimed that Communism was a Jewish plot. This is of course complete tosh. Judaism has nothing to do with Communism though of course quite a few prominent Communists were Jews. The Jewish faith and Jewish ancestry and culture meant nothing to Marx. He knew of his Jewish origins but thought that notions of ethnic and nationality identity were worthless. He also disbelieved in all religions. One of his works ”On the Jewish Question” is taken by some to be anti-Semitic although Marx was probably being facetious in his tendentious remarks in that particular article. The city of Trier lies near Luxembourg and is unusually prosperous. Marx grew up in a well-to-do family but was aware of poverty among others in his native city. He felt compassion for them. He fell in love with his neighbour Jenny who was a baron’s daughter. They later married. Marx was a clever lad and studied at Berlin and other universities. In those days it was normal for German undergraduates to move from one university to another after a year or so. He studied hard but found time to fight duels too. He was well versed in Ancient Greek philosophy. Of course he was deft in translating Ancient Greek as well as Latin. That was the mainstay of education in the Western World in those days and indeed well into the 20th century. He was profoundly influenced by a German philosopher of a generation earlier, Friedrich Georg Wilhelm Hegel. He became a Young Hegelian, it was a formidable intellectual movement at the time. He completed a doctorate in philosophy. Dr Marx felt compassion for underpaid farm labourers. He wrote in the Jahrbucher about their plight. Despite his sympathy for mistreated horny handed workers he was not opposed to child labour. Children working full time was par for the course in those days. Karl Marx later moved to Paris. He formed a friendship with Friedrich Engels. Engels was a Gentile German of radical views. Engels came from a bourgeois family. The Engels’ owned a factory in Manchester. Engels traveled there and was aghast at the horrendous conditions in which proletarians laboured and dwelt. Marx did not give the word communism to the world – it had existed since at least Thomas More wrote Utopia. It is about community, owning things in common. Monks were said to live the communist idyll. Communism is against the notion of private property. Communism purports to be about helping ordinary people especially the poor. In the beginning no one ruled anything. There were a few bands of hunter gatherers. They practised simple communism. No one in the clan owned anything personally. They owned all in common. It was a sharing, caring society. Leaders emerged and claimed a share of the produce of each. Government was a form of primitive despotism. As people developed settled agriculture the culture of the soil replaced foraging. Ownership of land became crucial. Someone said – this bit is mine. People began to stake their claim and the strongest gained the best land. As societies grew larger and more complex feudalism grew up with the king at the top, a baronial class beneath him and a great majority of peasants at the bottom of the pile. Religion had been around since the beginning. Religion was used to bolster the status quo. Religious language is often that of ownership to reinforce capitalist nostra. God made us so he owns us. Judeo-Christian texts speak of owning land and cattle. The laws in the Bible specifically deal with property rights and slavery. Many parables deal with masters and servants, with owning gardens. Capitalist law upholds the rights of the rich and enfeebles the poor. Possession is nine-tenths of the law – the adage is cruelly true. Supposing a gentleman farmer pays a farm hand $1o a day for his labour and on the back of this the gentleman farmer makes $20, minus the cost of the labour this was a profit of $10. That was $10 exploitation. The person the gentleman farmer sold the food or other agriculture goods to was also exploited at buying things at above cost price. Capitalist society had misused language to try to confuse goodness and honour with position on the social scale. A gentleman came to mean a man of property as much as a well-behaved and respectable man. The very notion of nobility was inverted from meaning laudable, courageous, charitable and trustworthy to mean a powerful thug who ruthlessly exploited the ordinary folk. Feudalism is inherently exploitative. The serfs have no rights. They have to pay rent on the land where the scratch a meagre living through backbreaking labour. As kingdoms grew large kings could no longer fully control the noblemen under then in the pecking order. Sufficiently large rebellions compelled kings to conceded a share of political power to those major landowners both temporal and clerical. Parliaments were formed with representation confined only to the magnates. There were some scintillating glimpses of what could happen, prolapses in history. For instance the Peasants’ Revolt in England in 1381 was a huge jacquerie with forced Richard II to promise the abolition of feudalism. Of course as soon as it was safe to do so he broke his word. The church was ever the bedfellow of the state and a major feudalist itself. The upper ranks of the hierarchy were almost without exception filled by members of families of the upper orders. The feudal lords invented a myth of the good landlord. The good landlord was meant to justify feudalism. The lord only owned land to give him enough money to equip himself as knight on a warhorse. He was then able to defend his people. He was actuated only be a wish to do the best for his peasants. When the crops failed or they were ill he let them off their rent. He was a born leader of his people. He cared about them and was kind to him. They looked up to him with reverence and a sense of mutual duty. Some poor peasants were duped into believing this nonsense. Likewise, a similar false image of monarchs was invented. Many of the lower orders fell for this. To this day many common people who have never met their monarch feel affection for them and respect the monarch. Some wish to be dominated, they want to be serfs. This is false consciousness. Many of the exploited are duped. They are too ignorant to see that they are being exploited. These people are not class conscious. Yes, they know they are lower class. In the days of yore they could scarcely forget it. Society was class-ridden. But they did not have class consciousness insofar as they could not conceive of the fact that the upper class was not their protector but their enemy. As society grew yet more sophisticated a mercantile class emerged. Banks were founded. A bourgeoisie emerged. The petit bourgeoise meant the small-time traders, shopkeepers and craftsmen. The grande bourgeoisie consisted of the professions such as architects, dentists, engineers and accountants as well as businessmen. In Modern era the bourgeoisie became the dominant class. Industry had become more important that agriculture. The means of production was not longer principally farmland. The means of distribution and exchange were no longer mainly town marketplaces and muddy roads with a few navigable river routes. Producing sufficient food to sustain the populace was no longer difficult though of course many people lived in a state of malnutrition because of their starvation wages. The ownership of banks, factories, shipyards, railways and coal mines had become more important than that of agricultural property. There is downward pressure on wages. Wage compression leads to workers being paid just enough to keep body and soul together. If businessman pays his workers more then his business will go to the wall. People want the most for the least. They pay as little as they can and demand as much as they can. They want more than they need because capitalism has taught them that greed is good. It fetishises consumer goods. Bourgeoisie revolutions overthrew kings and in some cases allowed the kings to remain as symbols but set up a bourgeois state for instance in the United Kingdom. Marx held that capitalism was effectual in developing the economy. It caused infrastructure to be built rapidly. It lead to scientific breakthroughs and inventions. He said that it was also utterly immoral. Capitalism was all about avarice. Capitalists worshipped mammon. They did not care a fig about the malnutrition of the masses. Each class ran society in its own interests. Class interests were necessarily antagonistic. The peasantry had long been the largest class in every society. Allow a peasant to own a little farm rather than rent it and he often becomes a petit bourgeois. These smallholders can be frustratingly conservative. What they have they hold. The abolition of the unjust capitalism would be in the interests of all but the rich but unfortunately many petit bourgeois are too purblind to see this. The proletariat was a new class that emerged during the Industrial Revolution. Proletariat is a Latin word which means ‘propertyless’ in English. The proletariat is made of those peasants who left the land and drifted into towns. Many of them became factory workers, construction workers, dockers, general labourers, train drivers, waiters, coal miners and the miners of various metals, street sweepers and so on. One often calls the proletariat the working class. The important thing about the proletariat is that they do not work on farms. They are normally urban but that is not essential. The essential factor is being non-agricultural workers. The capitalist class tried to minimise cost and maximise prices so they could get as much profit as possible. The proletarians languishing on poverty pay suffered from this vicious cycle – low wages, high prices. The capitalists also want there to be some unemployment. This is because this frightens workers. They fear starvation so they accept low wages. The exploiter likes to keep the exploited divided. Proletarians argue with each other. They fight for jobs. They are desperately competing to be exploited since this is not as horrific as starvation. Capitalists want maximum profit and minimum risk. These two imperatives tend to go against each other. High profit business tends to be high risk and low profit tends to be low risk. How to get around this? Monopoly capitalism. The whole justification for capitalism is that competition is good for the consumer. It lowers prices and increases the quality of goods and services. But one can have cartels to fix prices. One can have captive markets – enter colonialism. Capitalists conquered colonies to ravage them. Their natural resources were plundered and their people either reduced to frank servitude or made wages slaves. They were taxed and forced to buy good they did not need so that the metropolitan state would have a guaranteed market for its goods. The whole system was designed to line the pockets of the affluent. The colony is plundered for its natural resources. The indigenous people are seen as just another natural resource. This reservoir of labour is used for the benefit of the capitalists in the metropolitan. As well as seeing the people as a mere resource they are also a market for manufactured goods. A colony would be India for instance. A metropolitan is a country that rules that colony. That would be the United Kingdom in that case. Cotton, for example, would be grown in India. The British would ship it back to the United Kingdom. The cotton would be turned into shirts and then re-exported to India for the Indians to purchase. This would be a double shake down. The Indians were bilked twice. First their cotton was bought for a pittance. The workers produced surplus value in accepting less salary than they deserved. They then bought back the manufactured good based on the raw material that they had harvested. They were paying over the odds for it. Proletarians and peasants in India are exploited. Their British counterparts are also ripped off but not as badly. Racism is disseminated to prevent the British plebeians identifying with their Indian sisters and brothers. The British lumpenproletariat are made to believe that they are winners. They are duped into thinking this to prevent them from making common cause with the sons of toil in India. Imperialists care only for smash and grab. It is vulture capitalism at its worst. But a new stage was coming. The proletariat was growing more numerous and more alienated from their capitalist masters. They political and class consciousness was awakening. They would soon see their bosses for what they were – the nemesis. There can be no compromise with capitalism. It cannot be redeemed, it can only be destroyed. The proletariat would rise up in revolution. Capitalism would be dethroned and socialism would take its place. Socialism is run in the interest of society – of everyone, except the exploiting swine of course. They shall pay for their rapacity! Socii in Latin is a member – we are all members of society. Socialism means running things for the common good and not for private gain. People will be building the workers’ paradise. Socialism is a way station on the road to communism. Communism really is heaven on earth. Friedrich Engels was a German philosopher who was Marx’s main collaborator. In truth Engels was his sidekick. He is more or less and afterthought poor chap when he did a lot to redact Marx’s work after the world historical tipster died. Engels wrote of communism that ‘the state will wither away.’ The state had always been the prison of the toiling classes. The world would no longer be run in the interests of the exploiting classes. There would be no more state. The state would be unnecessary since it is an instrument of oppression. The bourgeois-capitalist state and its weapons (the police, the army, the courts and prisons) would be superfluous. Under communism one goes to a shop to get a pair of shoes, get, not buy, mark you. The shop assistant helps one. One chooses the shoes and leaves. Does the shop assistant call the police? No. But you have not paid for the shoes. There is no price for the shoes. Can one pay? There is no money to pay with. But call the police. There are no police to call. But is it not against the law to take the shoes? There is no law. There are no courts. There are no prisons. There are no criminals. There is no crime. Marx believed that people would co operate voluntarily. There would be no rule and no government. This is like anarchism with self governing communes that people are free to leave. Indeed in the late 19th century people thought that anarchism and communism were interchangeable terms. People even coined the word anarcho-communism. In the end the two ideologies fell out after 1917. They are now at loggerheads. One takes what one needs and then helps people to the best of one’s ability. As Marx wrote, ”from each according to his ability, to each according to his needs.” That is to say that people do their best for society – they work at what they are best at to contribute to the community. An individual receives goods and services not according to the wealth that that person has generated but according to what that person needs. There are no arguments about status and property. A sickly man with many children who cannot work would still receive a lot of goods and services because he needs them. A healthy man who does a lot of valuable work might receive very little because he needs little. People would not be jealous or resentful over this. People have ceased to be selfish. Capitalism is both a symptom and a cause of selfishness. This take, take, take mentality is sick. Conspicuous consumption is what capitalism is about – showing off. Making people feel inadequate until they buy whatever it is. Buy this and you will be popular and successful – that is how capitalism cons people. If we all pitch in we can all live well. That was the Marxist belief. He said that the aristocrats and some of the bourgeoisie were idle rich. This leisured class lorded it over the toiling masses. If the upper orders had to share their wealth and had to work then the workload would be much reduced. Moreover, people who make money for others are not highly motivated. If people know that by working they are bettering themselves and society then they will find work very gratifying. Marx did not explain how we would get to communism exactly. He was certain that it would happen. It was called scientific socialism. He believed he had scientifically proven it. There were world historical events and they all pointed this way. Marx believed that nationality was nonsense. It was a capitalist construct. The aim was to distract peasants and proletarians from the class war. But the coming class war was inevitable. Marx is buried in Highgate Cemetery, London. The original grave is a few metres from the current site. His resting place is marked by a plinth topped by a bust of K Marx. On the pedestal of his bust his words are etched ”Workers of all countries unite!” Commies from the world over are interred there including Iraqis. This graveyard has become a place of pilgrimage for leftists from all over the world. Marx’s writings were extrapolated on by subsequent generations of Marxism. Marxist-Leninism was the governing political philosophy of the Soviet Union. Marx’s works were used to make the most extraordinarily ridiculous value judgements. A Marxist take on science emerged, a Marxist view on the arts emerged. These perversions of Marx’s thought owed little or nothing to the scribblings of the good Dr Marx. Pastimes and possessions that were condemned as bourgeois were regarded as wicked. Hobbies and habits that were labeled as being proletarian were lauded highly. Bourgeois decadence was decried with an espeical vehemence.